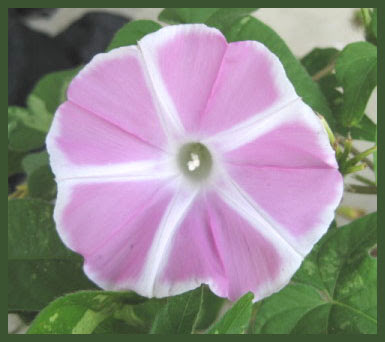 These simple beautiful flowers capture the mind of any poet ! In poetry, they remind us of the brevity and transience of life. 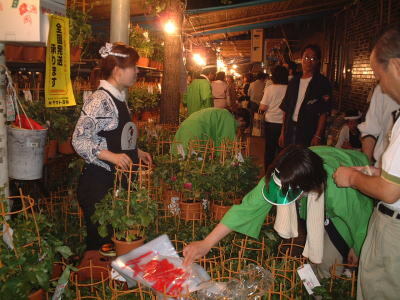 There are famous markets in Edo, and even now in Tokyo, where these flowers are sold. Asagao, the Japanese means "Morning Face". Let us look at some kigo with them. Click HERE to see the Market ! This was the most famous market for these flowers in Edo and is still held in our day at the Temple of Kishimo-Jin in Iriya. There are about 120 stalls selling all kinds of Asagao plants and amulets. Click HERE to look at them !
. 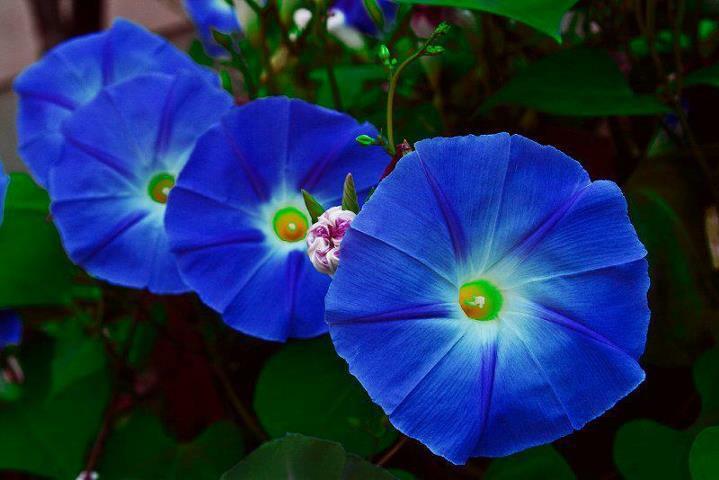 Windwheel 風車 kazaguruma .
. morning glory - Kenya . is the largest genus in the flowering plant family Convolvulaceae, with over 500 species. 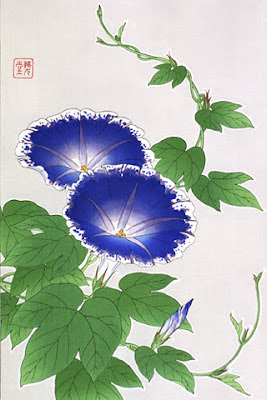 Most of these are called morning glories, but this can also refer to related genera.
. Seven Flowers / Herbs of Autumn 秋の七草 aki no nanakusa. a talisman to keep you healthy. It is sold at the Market in Iriya to our day, on July 6 to 8. 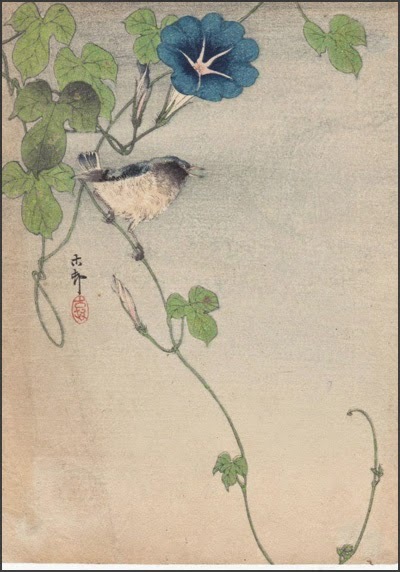 They come in various colors made from strong washi paper and are just as pretty as the real plants.
. Amulets and Talismans from Japan　－ Edo .
. Matsuo Basho - Food Haiku . My gate is bolted, my garden overgrown.
. heikan no setsu 閉関の説 . Read more of Issa's Haiku. Click HERE to look at it ! Near the end of the period of summer ascetic training, called Ango or Geango (cloistering himself for seated meditation for ninety days), a Buddhist monk living in Unrin-in Temple in Kitayama, Kyoto, prays to console the spirits of flowers offered to Buddha every day. At dusk a woman appears and offers a white flower. 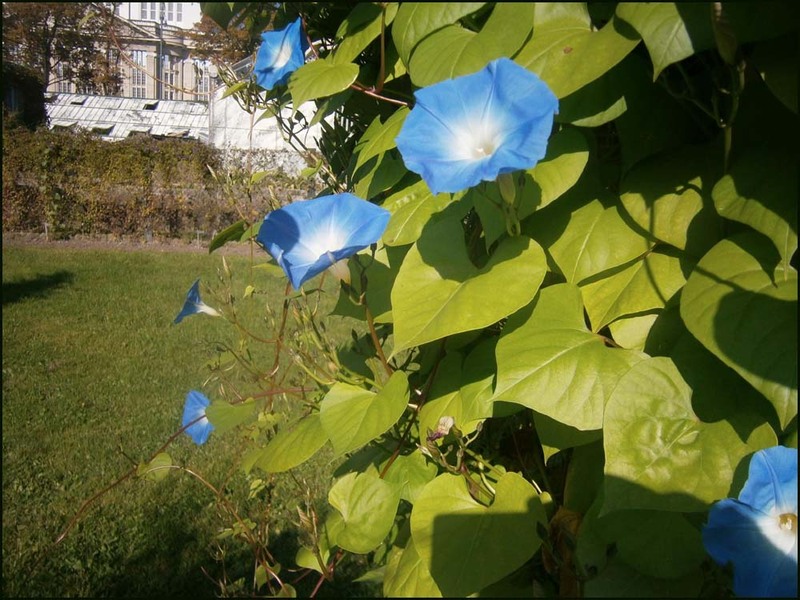 When the monk asks the name of the exceptionally beautiful flower, the woman answers that it is a moonflower. Pressing on, he asks the woman’s name, she says that her identity will soon be revealed even she does not give her name. Further, the woman says she came from the shadow of this flower and lives somewhere near Gojō in Kyoto. Leaving these words, she disappears in the moonflower. 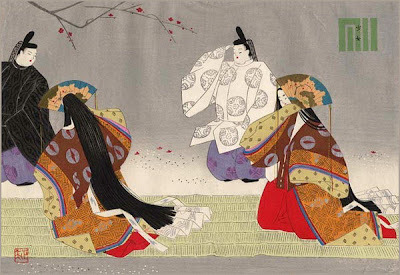 After listening to the tale of the love affair between Hikaru Genji and Lady Yūgao (Moonflower) from a villager, the monk visits the Gojō area, following the woman’s story. When the monk visits this place, there is a lonely-looking house just as in the past, with hinged half wall grilles entangled with blooming moonflowers. When the monk tries to console Lady Yūgao’s soul, the one who appears by opening up the hinged half wall grille is the ghost of Lady Yūgao. She narrates the memory of her love for Hikaru Genji and dances. Lady Yūgao repeatedly begs the monk to console her soul and returns inside the hinged half wall grille before the break of day. It was all a dream the monk had. Everything happens in the monk’s dream. "fruit of the evening face"
This hokku was written early in the 5th month (June) in 1814. This was a very important period for Issa, since, at 52, he'd just gotten married on 4/11 to a woman named Kiku, the 28-year-old daughter of a farmer and grain dealer in a town a couple of miles away from his hometown. Later Kiku returned to her parents' house for a while, and on 5/5 Issa went to her parents house, apparently for the first time. In his diary he writes "Issa became an adopted son," humorously suggesting that by entering his wife's natal home he was also entering her family register as the adopted son and changing his family name to his wife's surname. 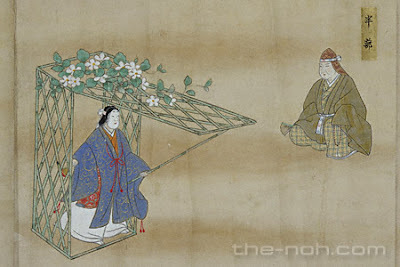 This matrilocal form of marriage was still fairly popular among farmers and merchants in Issa's time, though the samurai class was patriarchal and patrilocal. Actually, Issa's marriage was patrilocal -- probably because his own father's marriage was -- and he is just joking about entering his wife's family, but his humor surely contains some emotional truth, since he lost his mother and was separated from his father when he was young, and his mother-in-law now treats him like an outsider. No doubt Issa hoped he would able to have close relations with Kiku's parents and gradually become closer to the people living in his village and in Kiku's village. After staying the night at his wife's natal house, Issa returned the next day to his hometown, and his wife, her mother, and two other people followed him on the 5/8. 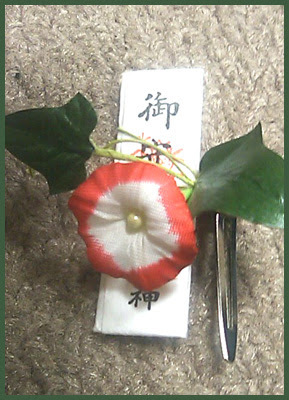 It happens that 5/5 (in 1814 it was on June 22) is the date of one of the largest festivals of the year in Japan, the Tango Festival, so it seems likely that the festival mentioned in the hokku is this festival. On 5/5 people took baths in warm water with wild flag leaves floating in them to purify themselves and protect themselves from diseases during the hot summer ahead, when epidemics were common. In many rural areas in Issa's time 5/5 was also known as "woman's house," and women -- legally unable to own property -- were allowed to own half of one tatami floor mat, which was symbolic of owning the whole house. In some areas men were supposed to stay outside all day, while village women chanted shamanic songs and carried out coming-of-age ceremonies for teenage girls inside. This custom is thought to have developed out of shamanic ceremonies performed by women at rice-planting designed to ensure a good crop. (In 1814, Issa says that rice-planting began on 4/24.) At the same time, under the influence of the ruling samurai class, more and more commoners were placing displays of samurai dolls and small swords and spears in their houses on 5/5. Many houses also raised pennants, the most common of which were shaped like carp vigorously swimming upstream. Special food was also served, especially rice cakes wrapped in an oak leaf. This might be Issa's mother-in-law if Issa is thinking of her as the mother of his wife rather than more formally as his mother-in-law, and I translate it to allow that possibility. She's put on a thin cotton robe for the summer festival, and she ties it with a colorful sash tied in a stylish way a middle-aged woman wouldn't use with her ordinary robes. Festival is a hot image, since people are excited, and Issa implies that she feels hot, perhaps further suggesting that she ties her robe a little loosely to cool off. If this is Issa's mother-in-law, the further suggestion would be that a third reason for her way of dressing is that she now feels relaxed with Issa around and has warmly accepted him as a son-in-law. The straw mat and the sash would then both suggest close but unspoken human bonds. a meditative posture and attitude.